[With my sincere apologies to Dr. Morris Massey.] Or AKA : Okay “newboy” this is how this stein collecting business really works! I first became aware of this “Chain link” phenomenon at an antiques show in the Columbia Maryland Shopping Mall many years ago. I saw a “piece of something” I liked at a booth and asked the price. The dealer told me he had just purchased it for ‘1$s’ amount at this same show the day before. He “really didn’t want to sell it” ….. BUT if I gave him ‘2$s’, then he would sell it to me, right then and there! 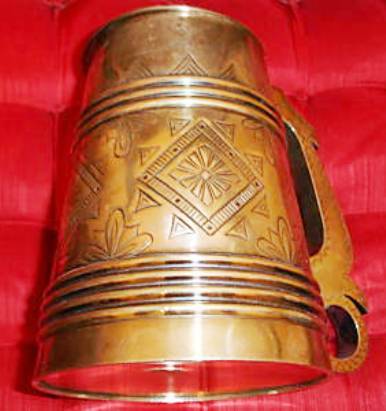 Then there are the eBay beer stein sales (a recent one is what prompted me to write this little discourse.) There are lots of ‘eyes’ out there on eBay and those eyes might have more resident knowledge about a specific type of stein than you do. 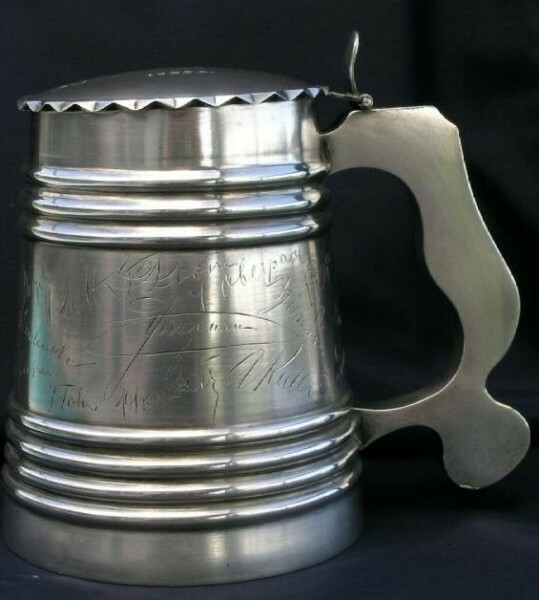 An eBay seller, Mr. X, whom I have dealt with for years now, listed a small (about a ½ liter) silver Estonian stein. I thought I might be interested in it (until I realized it was only a few years older than me! Ha, we can’t have that!) 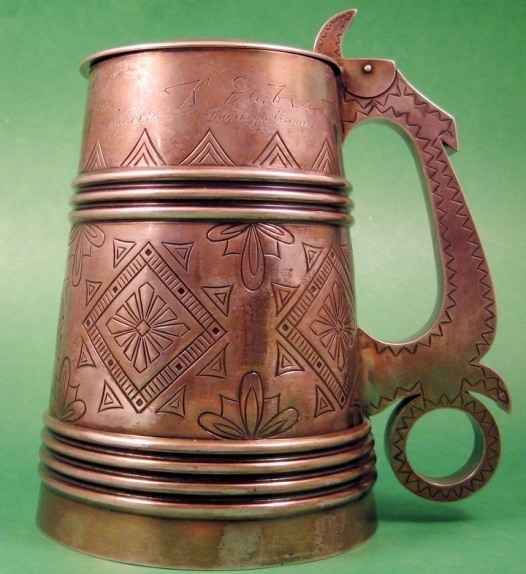 This seller has a family member in Europe who buys steins, etc, and ships them here to the USA, then Mr. X lists them, and so forth, and the profits are shared when the items are sold. Well in this case I think the start, or ‘1$s’, was different! It was actually another eBay sale. [B] My friend, Mr. X then listed it months later, and was asking a minimum of $2400.00. This is now the ‘2$s.’ link on the chain! It did not sell at the ad’s minimum price on eBay. I asked him months later if he still had it and he did not. Second case in point, [D], [E]: I only realized this example existed while sorting out my silver file photos for the above pages. 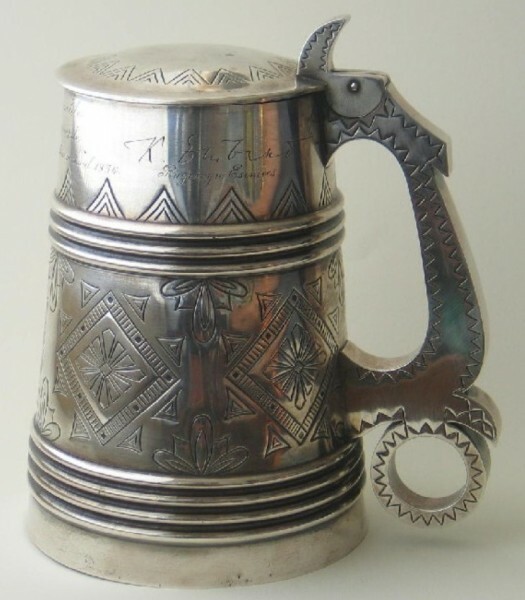 Interestingly enough, the examples are both about silver Estonian steins from the early 1900’s. [D] Sold on eBay for $311.00 = ‘1$s’ link on the new chain. [E] Several months later, along comes the ‘2$s’ link on the chain, with a minimum of $1750.00 to start! Now as only one side is shown on each and I can not compare the names engraved on the body, I can only assume it is the same stein; and I think it is. 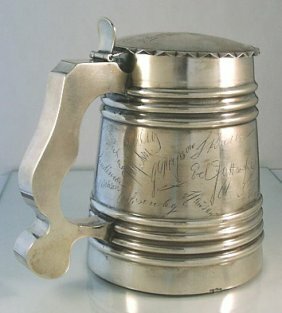 $311.00 for a silver stein, regardless of what year, was a give away – and some dealer (or me) should have grabbed it up!